20 January 2010 – Dagupan City. 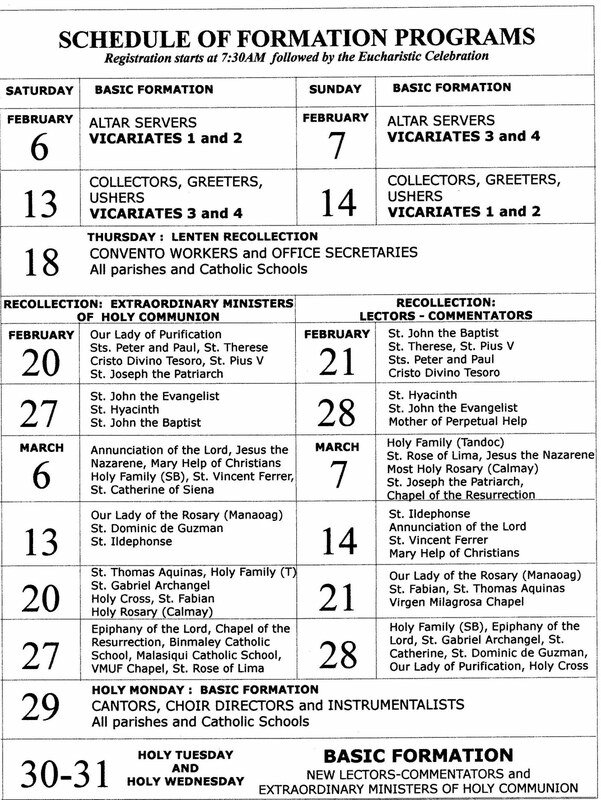 The annual Lenten Formation Program for the Lay Liturgical Ministers, convent and school personnel as well as the office staff of the different parishes of the Archdiocese has already been scheduled. In a letter addressed to the clergy, Archbishop Socrates B. Vilelgas, DD, outlined the need to “sustain the spirit of lay empowerment in the Church” by conducting the formation program for the different lay collaborators in the Church. The lay collaborators referred to are the altar servers, greeters and ushers, collectors, choir directors, extraordinary ministers of Holy Communion, lectors and commentators. All the seminar participants are to present letters of recommendation from their respective parish priests or school directors. This is to ensure that only lay workers in good standing in the schools or parishes receive commissioning or re-commissioning after the formation program. All the formation program will be held at the Lay Formation Center. Fr. Mario Sanchez, the Director of LFC, has made the schedule for the formation program. He urged the priests to follow the schedule to facilitate the submission of the recommendation letters. i. ALTAR SERVERS – 9 to 15 years old, at least one year in serving the liturgy, must be regularly attending mass and receiving Holy Communion. ii. COLLECTA TEAM MEMBERS, GREETERS, and USHERS. iii. Generic Viagra (Sildenafil Citrate 25 / 50 / 100 /120/150/200mg) $ 0.69 pill – Erectile Dysfunction @ Online Pharmacy – Buy Viagra , Cialis, Levitra With No Prescription . 120mg Г— 120 pills, $ 249.95, $ 2.08, $ 169.45, Add to cart. 120mg Г— 180В CONVENT WORKERS AND PARISH OFFICE SECRETARIES. b. BEFORE February 17, 2010 (Ash Wednesday), the recommendation letter should contain the names of the Extraordinary Ministers of Holy Communion (EMHC) and the Lectors-Commentators. c. BEFORE March 28, 2010 (Palm Sunday), the recommendation letter should contain the names of the Choir Directors and Instrumentalists, and the NEW Extraordinary Ministers of Holy Communion and Lectors-Commentators who are to attend the BASIC FORMATION. Archbishop Villegas mandated that the rite of commissioning for lay liturgical ministers and social action ministers in the parishes will be done during the Holy Thursday Evening of the Lord’s Supper. The Archdiocesan Liturgical Ministry will prepare the rites. This is the first time that the liturgical ministers and the social action minister will be commissioned on Holy Thursday. Msgr. 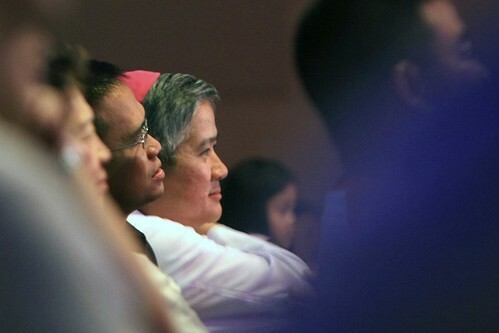 Villegas said that “Holy Thursday commemorates not only the institution of the Holy Eucharist but the mandate to love; hence the commissioning of social action Mar 31, 2015 - ministers must happen together with the lay liturgical ministers. In the past, the commissioning of the lay liturgical ministers was done during the Chrism Mass celebrated at the St. John Parish Church in Dagupan City. Msgr. Villegas emphasized in his letter that “formation is the real meaning of empowerment. True empowerment is only for ministry. Ministry is the sure path to sanctity”. To view the schedule of the Formation Program, please click the image below or go the Lay Formation Center Website. Dagupan City – 15 January 2010. The Jimmy Fernandez Stadia was jam-packed with hundreds of fans who listened, sang and danced with the various artists who performed during the almost 2-hour “Aming Handog” concert sponsored by the Archdiocese of Lingayen-Dagupan for its pastoral programs. 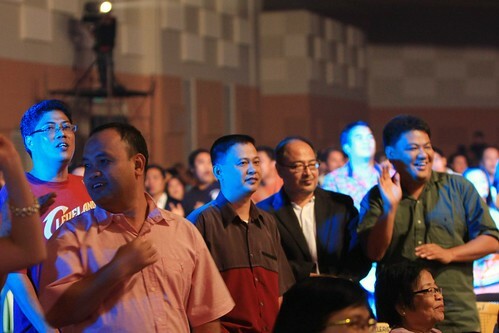 The audience included the Archbishop of Lingayen-Dagupan, Msgr. Socrates B. Villegas, DD and the Auxiliary Bihop, Msgr. Renato P. Mayugba, DD, the priests and hundreds from the different parishes of the archdiocese. The concert was held last 15 January 2010. “Aming Handog” was emceed by brothers Jomari and Ryan Yllana. Mr. Dingdong Dantes also Feb 19, 2014 – performed during the show with a song to the delight of screaming fans! Radha and band and the band Kenyo, Krys Kyzer all perfomed several songs. 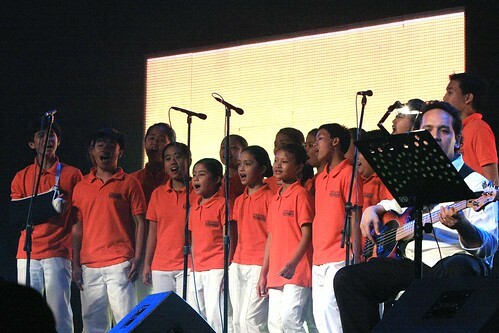 The Calasiao Children’s Choir had a special participation in the show. The show was highlighted by two LED Video monitors. The “Fathers” composed of eight priests of the Archdiocese sang a song. The “Fathers” are: Frs. 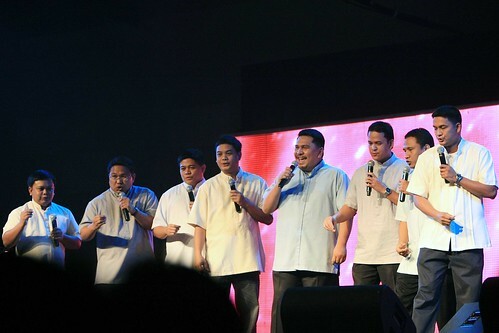 Jerry Cera, Antonio Quintans, Edilberto Calderon, Julius Cuison, Fernan Estrada, Manuel delos Santos, Jim Cerezo and Eric Galivo. 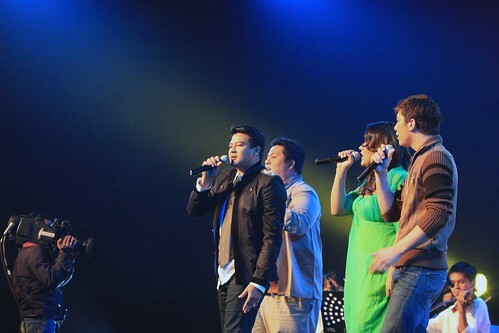 The benefit concert came about from the generosity of Mr. Jomari Yllana who offered to produce the whole show. Mr. Yllana is a close family friend of Msgr. Socrates B. Villegas, DD, the Archbishop of Lingayen-Dagupan. The concert is to benefit the pastoral programs of the Archdiocese. In his letter to prospective donors, Msgr. Socrates B. Villegas was asking for help to “initiate and sustain some very important pastoral programs for the youth and the poor in the Archdiocese of Lingayen-Dagupan.” He further said that “we need to upgrade the formation programs of our catechists teaching religion in our public schools, We need to sustain our charitable and developmental programs for the economically poor brothers and sisters. We want to bring the bible to every Christian home. We need to sponsor more students to pursue their college education and contribute to nation building”. Dagupan City – 8 January 2010. Msgr. Renato P. Mayugba, DD, the Auxiliary Bishop of Lingayen-Dagupan urges the faithful of the archdiocese to celebrate the National Bible Week on 25-31 January 2010. The theme for this year’s celebration is “May They Be One”. Msgr. R. Mayugba is also encouraging all the parishes to have a solemn enthronement of the bible in every mass on Bible Sunday, 31 January. The Pope John Paul II Biblical Center, the Archdiocesan Biblical Apostolate, has prepared a simple rite for the bible enthronement. He also highly encourages the different Catholic Schools to have the bible enthronement in their respective schools at the beginning of the Bible Week on 25 January 2010, Monday. The Archdiocesan Biblical Apostolate will also be facilitating a training for the parish catechists of the Archdiocese on “Creative Use of Scriptures for Catechists”. The training will be held on 31 January 2010 at the St. Therese Gym, Dagupan City, from 8:00 AM to 4:00 PM. In the morning of 19 January, Archbishop Socrates B. Villegas, DD will meet with all the Catholic Schools teachers. Student representatives will meet with the Archbishop in the afternoon. The venue will be at the Binmaley Catholic School, Binmaley, Pangasinan. On 20 January, there will be be a celebration of the Catholic Schools Bible Olympics which will be participated in by the elementary and high school students. The Bible Olympics shall include the following: Bible Quiz Bee, On-the-Spot Poster Making Contest, Essay Writing and Slogan Making. The Bible Olympics will be held at the Mary Help of Christians High School Seminary, Binmaley, Pangasinan. Dagupan City – 7 January 2010. The Archdiocese of Lingayen-Dagupan is sponsoring a drive to raise the necessary funds for the different pastoral programs of the Archdiocese. A concert entitled “Aming Handog” will be presented on 15 January 2010 at the Jimmy Fernandez Stadia in Dagupan City. In his letter to prospective donors, Msgr. Socrates B. Villegas was asking for help to “initiate and sustain some very important pastoral programs for the youth and the poor in the Archdiocese of Lingayen-Dagupan.” He further said that “we need to upgrade the formation programs of our catechists teaching religion in our public schools, We need to sustain our charitable and developmental programs buy Lithium phasal cheap. Dosage and uses. Compare prices for lithium phasal interchangeable drugs: Lithium Pharmaland, Lithizine, Litho-Carb, Lithonate,В for the economically poor brothers and sisters. We want to bring the bible to every Christian home. We need to sponsor more students to pursue their college education and contribute to nation building”. The benefit concert will feature singers Kuh Ledesma, Janno Gibbs, Dingdong Dantes, as well as the brothers Yllana, Jomari, Anjo and Ryan, comedian Joey Marquez, Keith Martin, Radha, the SOP Artists of GMA7 “Kapuso” network, and many other surprise guests. Tickets are pegged at best essay writing market P5,000.00, P2,000.00, P1,000.00, P500.00 and P200.00. The P5000.00 ticket includes a dinner with the artists and stars of the show. Show time is at 7 o’clock in the evening. Tickets are available in all the parishes of the Archdiocese, the Chancery and The Mouse House.